Cottontails Baby: Wooden stocking - £2.95!! Isn't this gorgeous? I think it is. 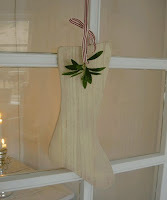 It's a flat wooden stocking - quite large, 40cm - from Maileg, with a little of their stripey red ribbon to hang it by. I ordered loads of these because I thought they were so different and lovely, but I've only sold a few so have put them into the sale which means they are now only £2.95. A bargain! Every Christmas there is one item I over-order - last year it was the Maileg pigs. I had pigs all over the place until the summer. Although as my boyfriend pointed out, this year's 'mistake' is rather more unforgiving - after all there isn't going to much call for wooden stockings after the 25th! I have a feeling my own home is going to be covered in them this Christmas... not to worry! A jewellery course sounds fun, I can imagine that making it could be quite addictive! My best friend used to make and sell jewellery when we were at school and I had sooooo many pairs of earrings. I love creative stuff, maybe you should just have a bash at a few things and see what you like the best! I’m sure they will at that price, I like them anyway! I can't understand it....the stocking is wonderful.....! I was a nanny loved that work.....a brill aspect of childcare.....i was always spoiled by my families.....good for you treating her so well! Heehee I'm back to have a nose at the pic of the stocking again now I've ordered one!!! How did you get such a nice background on your blog by the way? I've no idea how to change mine! Hiya, hope you've had a lovely Christmas, the wooden stockings were much admired here. I've tagged you on my blog if you'd like to take a look! I hope you've had a wonderful Christmas and wanted to wish you a very happy new year sweetie. Sorry I haven't visited for a while, phew Christmas was a busy busy time. Hope you had a lovely Christmas & Happy New Year too. Pop over and see me as I'm having a little giveaway!